As the clock ticks down to the day next year when Britain leaves the EU, minds are finally becoming focused: the Leavers’ snappy but meaningless soundbites need to be replaced by real solutions to increasingly pressing problems. So it was that the Tories’ European Reform Group summoned the media to hear their proposals for the Irish border issue. It sounded serious. The ideas were presented solemnly. And they were dead on arrival. The realisation that this convocation of the self-interested, ideologically-driven, and utterly clueless might not have the first idea what they have got us into has not yet hit home in the most fervent of the right-leaning papers. Nor do the broadcasters appear to have taken on board the sheer vacuity of the happy Brexiteers and their collective idiocy. 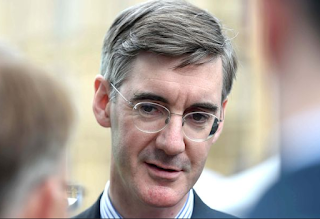 But slowly, surely, those pennies are beginning to drop, even at the Daily Mail, where readers are told “Tory Eurosceptics today unveiled their plan for the Irish border and insisted the issue which has deadlocked the Brexit talks can be easily solved … Rees-Mogg insisted the proposals had been drawn up from the EU's perspective to win Brussels' support, while Mr David [sic] said they should 'unlock' the negotiation”. 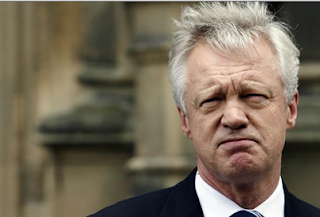 That, though, was followed by “The draft bears a striking resemblance to the model Mr Davis tried and failed to promise as Brexit Secretary before resigning in fury from the Government”. And the Guardian is rather more honest about the shortcomings. 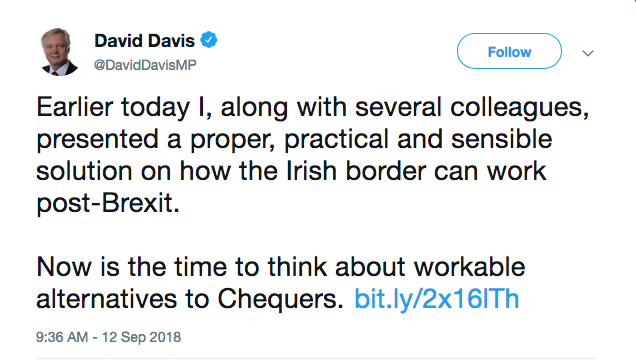 “There is little new in the European Research Group (ERG) paper on the Irish border … It does not have any big breakthrough idea, it does not have a text on a potential backstop and its proposals do not involve EU checks in British ports”. There was worse to come. 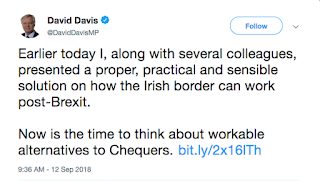 After David Davis had grandly told “Earlier today I, along with several colleagues, presented a proper, practical and sensible solution on how the Irish border can work post-Brexit. 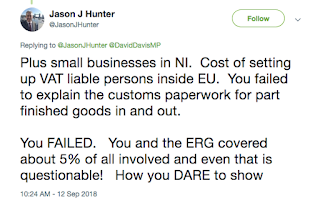 Now is the time to think about workable alternatives to Chequers”, Jason Hunter - that’s someone who knows about trade agreements - put him straight. “And yet you completely failed to take into consideration country of origin rules. 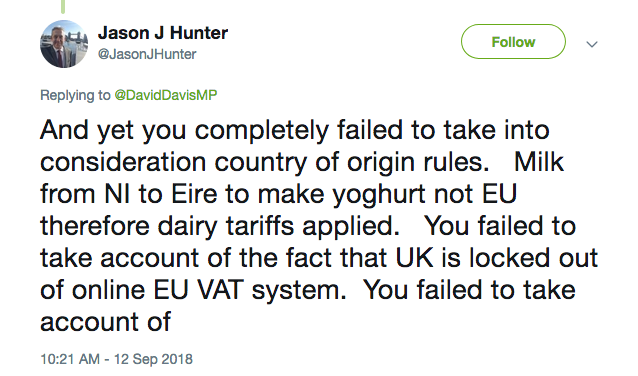 Milk from NI to Eire to make yoghurt not EU therefore dairy tariffs applied. 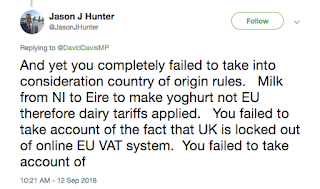 You failed to take account of the fact that UK is locked out of online EU VAT system. 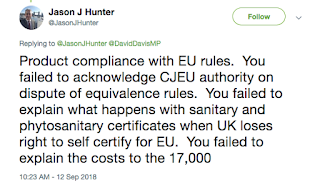 You failed to take account of Product compliance with EU rules. You failed to acknowledge CJEU authority on dispute of equivalence rules. 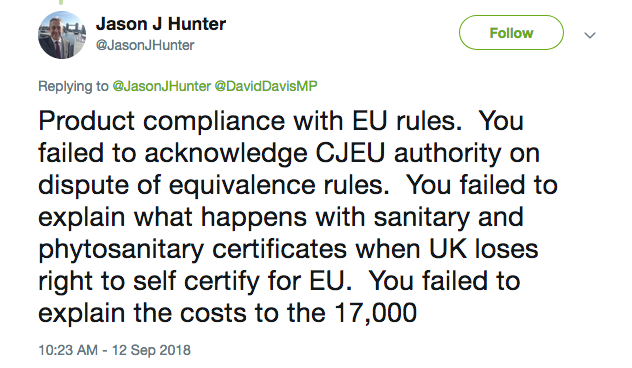 You failed to explain what happens with sanitary and phytosanitary certificates when UK loses right to self certify for EU”. There was more. 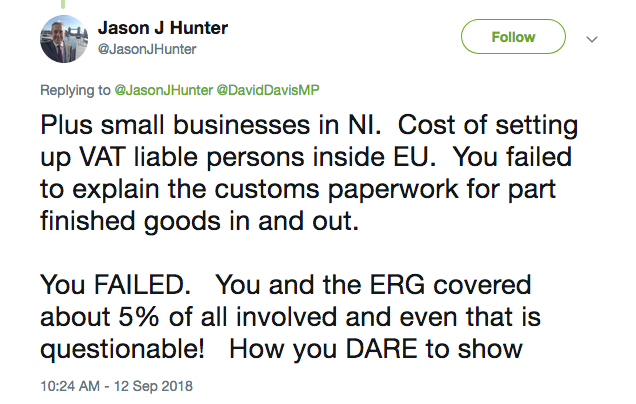 “You failed to explain the costs to the 17,000 Plus small businesses in NI. Cost of setting up VAT liable persons inside EU. You failed to explain the customs paperwork for part finished goods in and out”. His conclusion was as damning as it was direct. “You FAILED. You and the ERG covered about 5% of all involved and even that is questionable! How you DARE to show your face in public is SHAMEFUL! Either you STILL don't know what you are doing or your are deliberately lying to the public. Those are the only two choices!”. As I said, the ERG proposals were dead on arrival. Even the soundbites make no sense, such as asserting that the EU “must seek to learn more from respected voices in Northern Ireland”. Northern Ireland voted to Remain. Any purported 'technological solution' for the border issues founders immediately on the simple phrase, "government IT project". Such phenomena are - and have been for at least two decades - littered with the broken dreams of successive technocrat civil servants and ambitious and ignorant ministers. If, for instance, HMRC can't even get its existing systems to talk to each other properly after a decade (I know this from bitter and ongoing first-hand experience), then what chance a brand new system being remotely usable, irrespective of the time-scale involved? They are also colossal wastes of public money, most of which ends up in the outsourcing contractors' accounts in Luxembourg and other similar dodge-havens. And then the same companies are tasked with putting right what they themselves cocked up. And yet the amalgamated union of dingbats who put forward these 'solutions' are still treated with undue deference by the state and corporate media. "How you DARE to show your face in public is SHAMEFUL!" 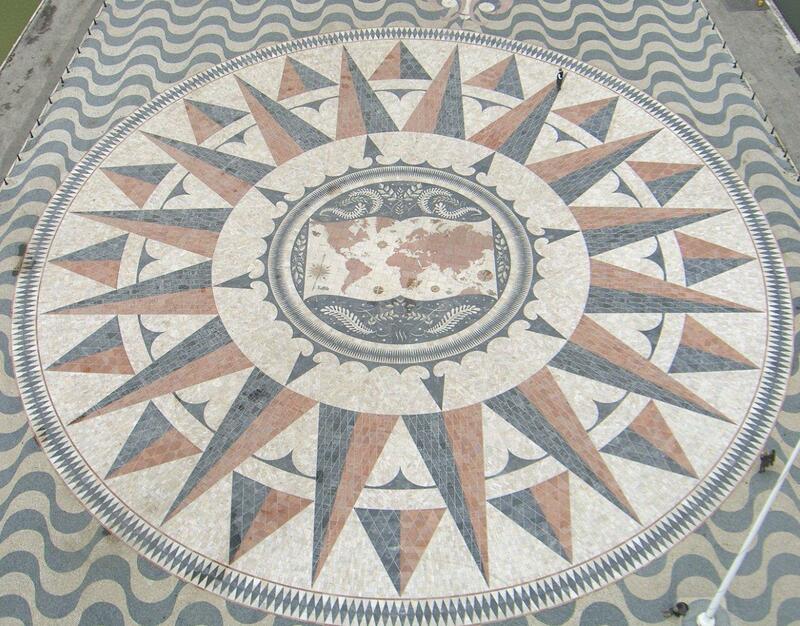 The European Research Group (ERG) is the English Tossers Club (ETC). There's a straightforward solution to the so-called "border issue": Reunify Ireland. 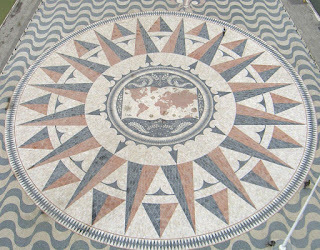 A quick glance at the map will tell you why. It won't happen of course. Not while the writ of Northern Ireland is taken from that loopy load of nonsense titled the Old Testament. You'd think 800 years of that claptrap would have evolved by now into common sense. Alas. How ironic that the Old Testament is the only prop to keep the present hapless government in power. Comparing the EU's negotiators with the ERG is like comparing Kepler's 'Laws of Planetary Motion' with Blyton's 'Noddy At The Seaside'.